Last month I posted The Best Online Tools For Real-Time Collaboration. I was exploring those tools more for my own professional development and professional relationships since, because of time zone issues with our International Sister Classes Project, it seemed unlikely any real-time collaborative work was going to work with my students. At some point, however, I can see how our classes might consider doing joint projects not in real time (I believe that type of relationship is also called asynchronous. However, if I can’t spell it or pronounce it without a dictionary I’m not going to use it!). I using the word “Best” hesitantly. I suspect there are quite a few other online tools out there, and I haven’t experimented extensively with any of them. If you have some suggestions, I’d be happy to hear it and put out a revised version in the near future. That’s one reason I’m not going to be listing sites in any kind of ranked order. 2. …be accessible to English Language Learners. 3. 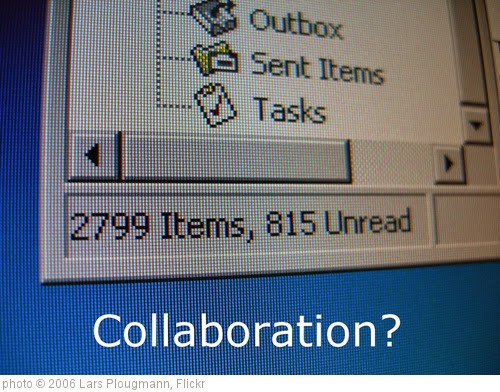 …have specific collaboration tools. Most Web 2.0 tools, of course, have collaboration potential if you just email your password to somebody else. In order to make this list, however, the online application had to have a specific “value-added” and simple process to invite and work with others to develop shared projects. 4. … not require any downloads. A number of sites on the “real time collaboration” list are also useful for working together not in real time. Rather than share them again here, I’m going to suggest you just explore that list on your own. Also, wikis are online tools that should probably be included on this list. However, I still have not gotten around to using them, and still don’t really know how. I’ve posted in the past, though, about some good resources sharing how to use them in the classroom. You can check them out if you’d like. While you’re at it you might want to review all of my other “The Best…” lists. Mixbook allows you create a slideshow with collaborators. It seems fairly similar to Fliptrack — without the music — but I might be missing some differences. Google Maps has a neat feature so you can create maps with others. The fine blog Free Technology For Teachers has a nice video showing how it works. Zee Maps is another simple tool for collaborative map creation. Shutterfly seems to have a special collaborative feature that allows you to make joint photobooks. There are a number of online word processors that invite easy collaboration, and not the least of these is Google Docs. You can find others by looking at the list of sites I’ve made for real-time collaboration. Zoho Discussions is a super simple way to create “chatboards” that would work well for “sister classes.” There are a lot of alternatives, including ones that have the ability for users to participate in a chatboard by leaving audio messages. But I’m including it here just because it’s so easy. Penflip seems like a fairly easy collaborative writing too. There may be better ones on this list but, with District filters, you can never have too many options. Please share reactions and other suggestions! Thanks for listing Protagonize (http://www.protagonize.com) in your post! I really appreciate your support and patience. Groups design is coming along nicely — I’ll be off for a week on holiday in Hawaii next week, but I hope to get the feature up and running quite soon after I return. TeachShare is also a great way for teachers to collaborate http://bit.ly/ijxPUU and it has some useful resources. the netherpad site appears to have morphed into a link site selling mattresses and bedding…. and I can’t find it elsewhere, so maybe it’s also disappeared. Thanks for letting me know. I’ll remove it from the list. Tom Grasty, cofounder of Stroome, the latest addition to your list. Great resource, which I’ve referenced more than once to educators looking for collaborative tools. Pleased to have made the cut.